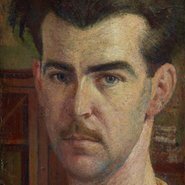 Among the artist’s paintings that are a treasured part of the Gallery’s collection, writer, broadcaster and journalist Scott Bevan will reveal stories from William Dobell’s dramatic life and career. In his new book, Bill: the life of William Dobell , Scott explores how ambition and talent took a working-class boy a long way in the world, and how the critical reaction to one of his paintings almost destroyed Dobell. This spotlight talk is part of the Third Sundays at the Gallery program, a State Street Learning for Life initiative.